Although I’ve “been told”, over the years on the ranch, to not name my cows, I do so anyway. But only for the ones that have a unique-ness or a story or……a place in my heart. Like Trixie. She was born with a stunted back leg, thus leaving her with three good legs. I turned “tri” into “Trixie”. Because of her minor disability….she did get around fairly well….she was allowed to stay home instead of out to pasture every season. Her first calf was a handsome steer and she delivered him quite easily and on her own. In fact we were both alone that year as hubby was full-time trucking and I was nervously responsible for supervising her first calf. Then last year she needed an expensive C-Section to deliver her fancy heifer calf, Suzy-Q. I was so happy that she gave us a heifer as I knew I wouldn’t be allowed to keep Trixie around too much longer. Her disability was getting greater as she got older and I knew hubby would not put up with another C-Section. This week Trixie left the ranch to be slaughtered. It bothered me more than I expected. But I’m okay now, a couple days later. 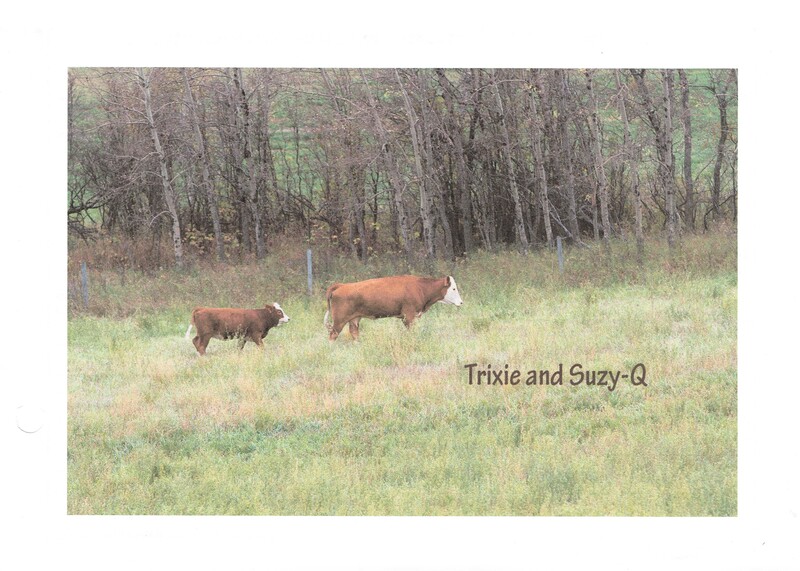 I have her fancy heifer calf to keep with us for years to come and Trixie’s legacy will carry on through her, Suzy-Q. Then there’s always the others….Puddin’, Zsa-Zsa, Vanilla Dip, Shaggy…..